composer, pianist, and electronic musician, makes music with self-designed sonic systems that include acoustic and electroacoustic instruments, interactive software, computer networks, microtonal tunings, and improvisation. His compositions are designs for performances in which people bring to life the musical structures embedded in scores, instruments, and machines. He has also performed and recorded music by Henry Cowell, Luc Ferrari, José Maceda, John Zorn, David Rosenboom, Larry Ochs, Glenn Spearman, Wadada Leo Smith, and with Pauline Oliveros, Fred Frith, the Rova Saxophone Quartet, William Winant, and Frank Gratkowski. Composer/performer Kyle Bruckmann’s work extends from a Western classical foundation into gray areas encompassing free jazz, electronic music and post-punk rock. A busy and varied performance schedule and appearances on more than 80 recordings have led to his recognition as “an excellent composer, striking the right balance between form and freedom” (Signal to Noise), “a modern day renaissance musician” (Dusted) and “a seasoned improviser with impressive extended technique and peculiar artistic flair” (All Music Guide). 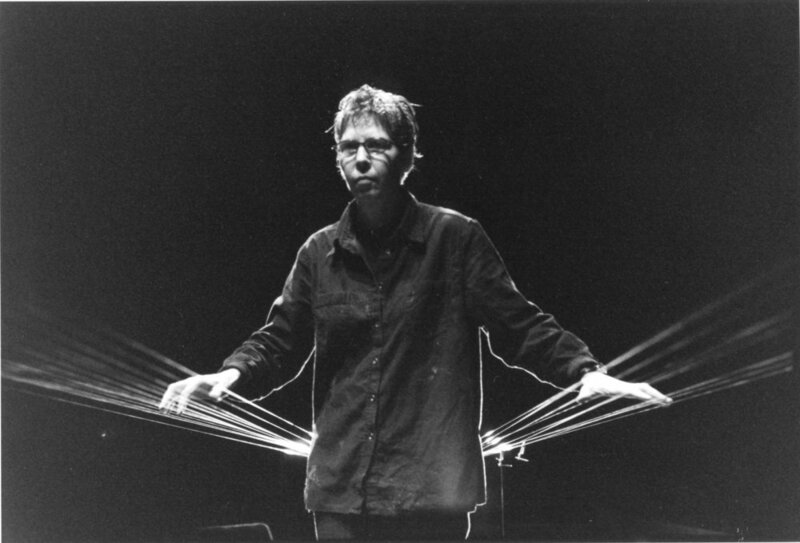 has been developing her installation, the Long String Instrument, for over 30 years; exploring the acoustics of large resonant spaces with her compositions and collaborative improvisations. She has been the recipient of numerous awards, commissions and residencies including: Foundation for Contemporary Arts Grants to Artists (2015); Center for Cultural Innovation Grants (2008 and 2013); Japan/U.S. Friendship Commission/NEA Fellowship for Japan (2007); and DAAD Artists-in-Berlin residency (2000). Fullman has recorded extensively with this unusual instrument. is a composer, guitarist, mandolinist, and a professor at the University of California, Santa Cruz. He previously was professor at Dartmouth College, where he served as chair of the music department from 1998-2013. He is a founding member and co-director of Frog Peak Music (a composers' collective). He co-wrote HMSL (Hierarchical Music Specification Language) with Phil Burk and David Rosenboom. The son of internationally performing sitarist Roop Verma, a disciple of Ali Akbar Khan and Ravi Shankar, Arjun Verma began learning sitar at age five and began performing at age seven, and has played concerts across the globe, including with Alam Khan, Pandit Swapan Chaudhuri, Bob Weir of the Grateful Dead, Fareed Haque, Pandit Sharda Sahai, Ustad Shabbir Nisar, Kai Eckhardt, Krishna Das, Maya Kherani, Salar Nader, Nilan Chaudhuri, Indranil Mallick, Anirban Roy Chowdhury, Sean Panikkar, Andriana Chuchman, and the St. Louis Symphony. Arjun’s music has received critical acclaim from leading publications, including the New York Times, Sruti Magazine, the St. Louis Post-Dispatch, and the San Francisco Chronicle. is a composer, cellist and vocalist active at the intersection of music, experimentation, improvisation and the synergy of multiple disciplines. Bridging sound, movement, theater and visual art, her primary interest lies in finding the potential for transformation for both the artist and receiver alike. She collaborates with many singular artists, including Fred Frith, Ellen Fullman, Luciano Chessa, Annie Lewandowski, Chris Brown, Søren Kjærgaard, Carla Kihlstedt, conceptual artist Jonathon Keats and filmmaker Daria Martin.